The blocks follow the pattern Strawberry Fields (from the book Material Obsession), made from a fat quarter bundle of Kyle’s Marketplace by RJR Fabrics (gifted to me by my Mom). However, the border design is all my own, utilizing the Very Hungry Caterpillar stripe, carefully fussy-cut, and pieced to include the small blue stripes that look like a tiny sashing detail. I finished this top two years ago, and the quilting is SO WORTH THE WAIT! 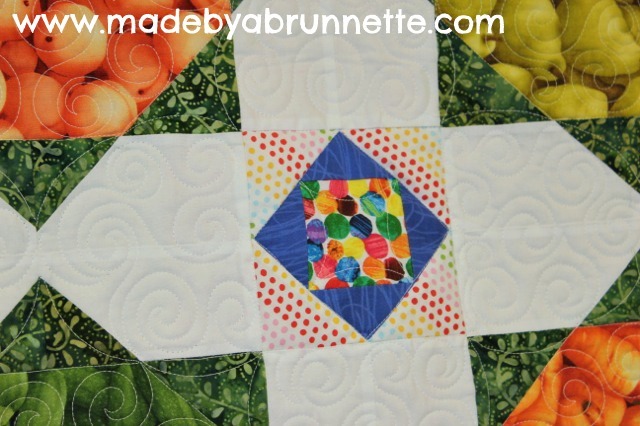 Love the irregular sized swirl background, the detail around the food in the border, and on the sashing squares and triangles–methinks I need to take better photos! …and because, as usual, I didn’t buy enough backing fabric, their are leftover prints from the front used to complete the back! However, it’s a happy accident–this is one of my favorite quilt backs, ever! I’m keeping this one for me (why not, Tuesday is my birthday, after all!). Maybe if I have it out on display, it will remind me to stick to a healthy diet! I think The Diet Quilt is soon to become my favorite. Do you have a favorite quilt you’ve made? Did you keep it for yourself? Hi there. I saw you over at “live a colourful life”. Your work is gorgeous! Love those hexagons I saw. I love this quilt! It was awesome seeing it in person at our retreat. 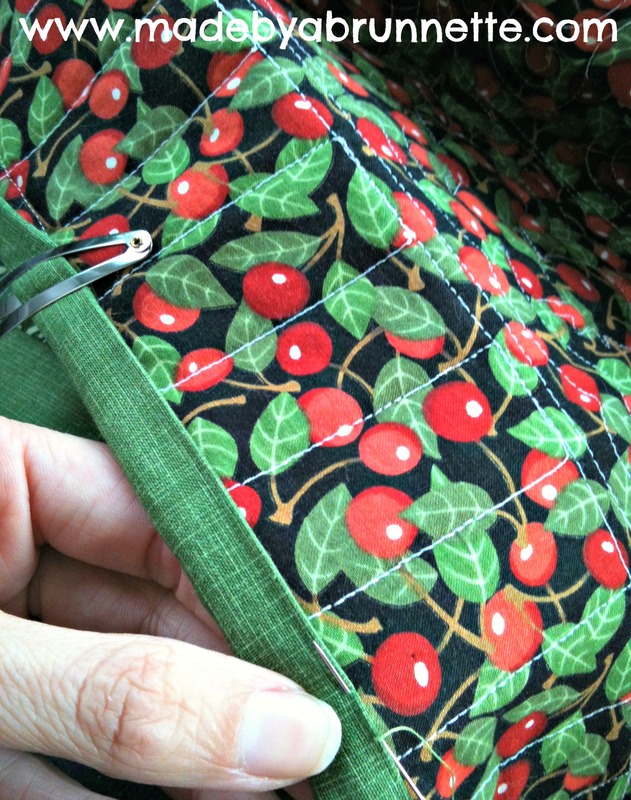 I love the way you used these food fabrics. And the quilting really puts this over the edge. I usually keep most of the quilts I make because my family isn’t into them as much. But my brother does have a couple, including the very first quilt I ever made, 12 years ago. Great quilt Doris! So glad you are keeping it for yourself. Happy early birthday too by the way. I am still inspecting the border trying to figure out how you did that! Very cool. Love your feature over at Cindy’s Live a Colorful Life. That is so adorable! I’ve been keeping a few of my projects. One I’m working on now stays with me. Love the border treatment you did. The parade of fruits is so stinking adorable! Love the border with the Eric Carle strippie. I need to buy some of that! Out of stock right now but I’ll be watching for it. Happy Birthday tomorrow! May it be a blessed day. Love how it all turned out! You have the BEST long-arm quilter. I LOVE It front and back. Amazing. I will definitely link to this as soon as I have a chance to blog again! 🙂 Great work! Very, Very Pretty! Worth waiting to see. I think all my quilts are my favorites. How silly is that. Happy Tuesday Birthday! What fun! 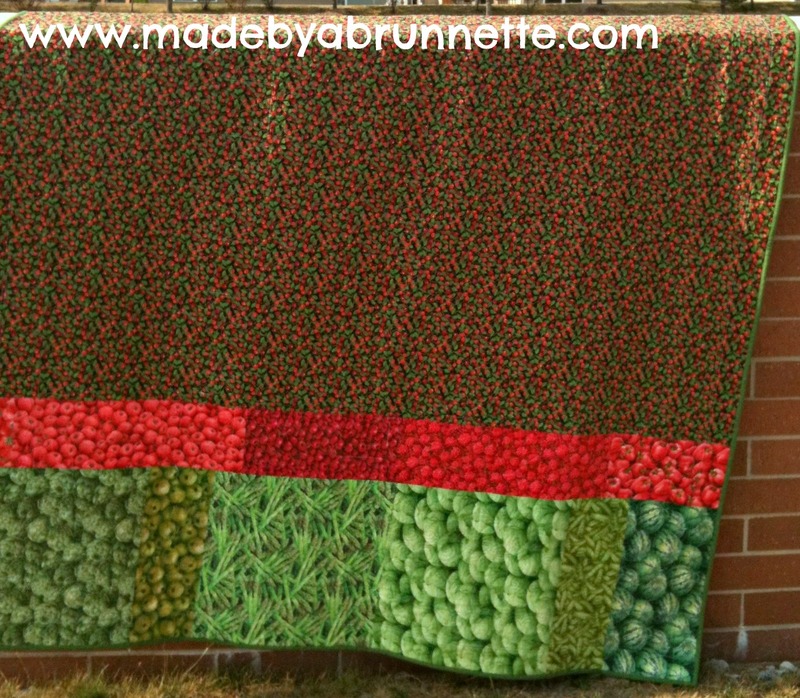 I really like what you did with those veggie fabrics. They’re not easy to make look so good. OK, I’m going to go eat something healthy now.